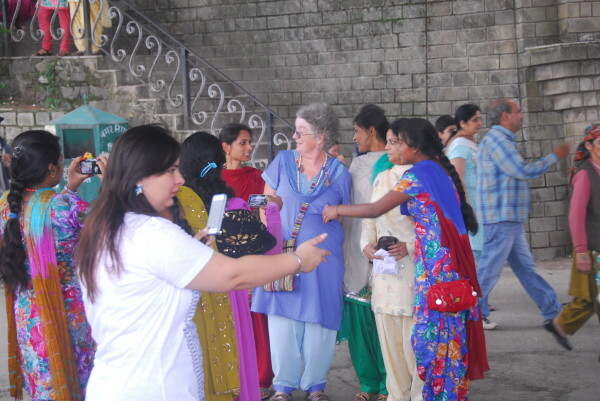 Here in the mountains of India there is so much to be grateful for. Just the ability to have come here from Australia and to be able to spend nine weeks exploring some of this great country is such a gift from the universe. And each day there is so much to trigger appreciation and thanks. 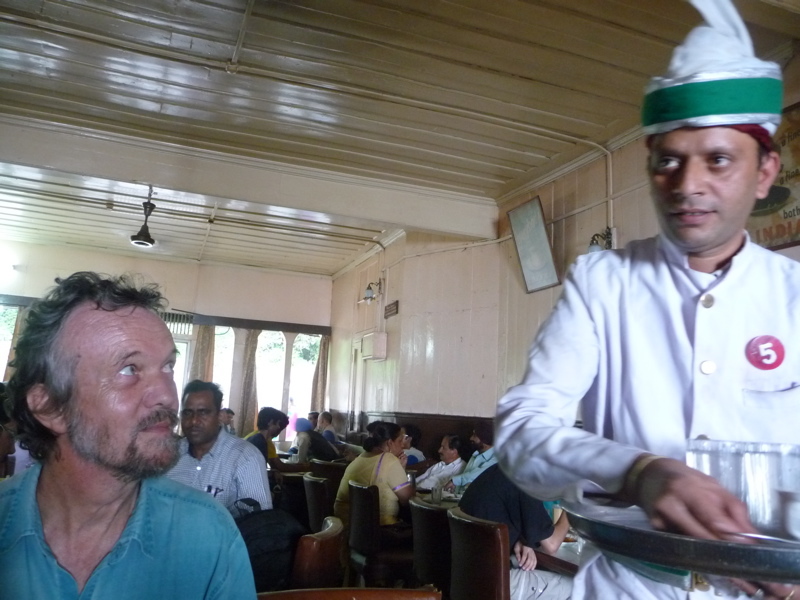 The courtesy, charm and helpfulness of the many men and women looking after our basic needs in hotels and restaurants is outstanding. Arriving in a new town, our taxi or tuk-tuk driver rarely knows where to find our hotel but when they ask, quickly a group of eager helpers form to give directions. On two occasions a man has actually jumped into the front seat to show our driver all the way to the hotel! How often would this happen in Australia, I wonder? When I think of all the delicious food we have been given, without us raising a finger – except to make the effort of choosing what delicacy to have today – I am filled with gratitude. So many people and other life forms have been involved in planting, pollinating, fertilising, harvesting, storing, transporting, and now cooking, presenting and serving this delicious food and drink. They fill our rice bowl and we fill their rice bowl indirectly with our cash. And if I think of the many, many hands our cash has passed through, my mind spins! Then there is the majesty of the mountains; the wonder of the engineering and architectural skills that have built these numerous buildings, apparently one on top of the other, up the steep mountain sides. Outside our window – and the windows of most of the hotels we have stayed in – there is a sheer drop, followed by several rooftops to look over to distant hills with more carefully inlaid buildings to house our ever-expanding human race! Another of my particular pleasures is watching the brightly coloured tunic outfits, dresses and veils of the women parading the streets of these cool, holiday mountain towns we have the privilege to be visiting. It is with great joy and thanks that I have been able to join these Indian women in wearing such beautiful, feminine and comfortable clothes and ephemeral veils. It feels like at last I have come home as a woman! And, again, I am filled with gratitude. 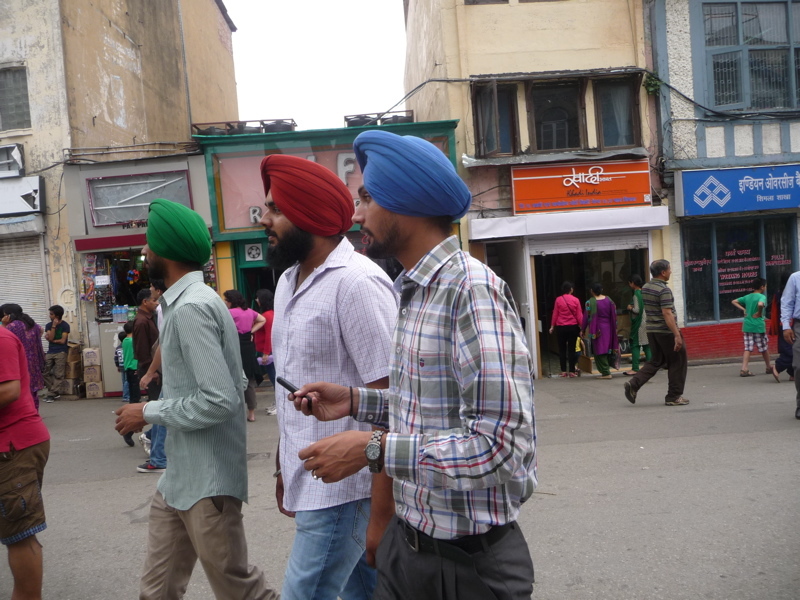 And the Sikh men with their coloured turbans are also beautiful to watch! 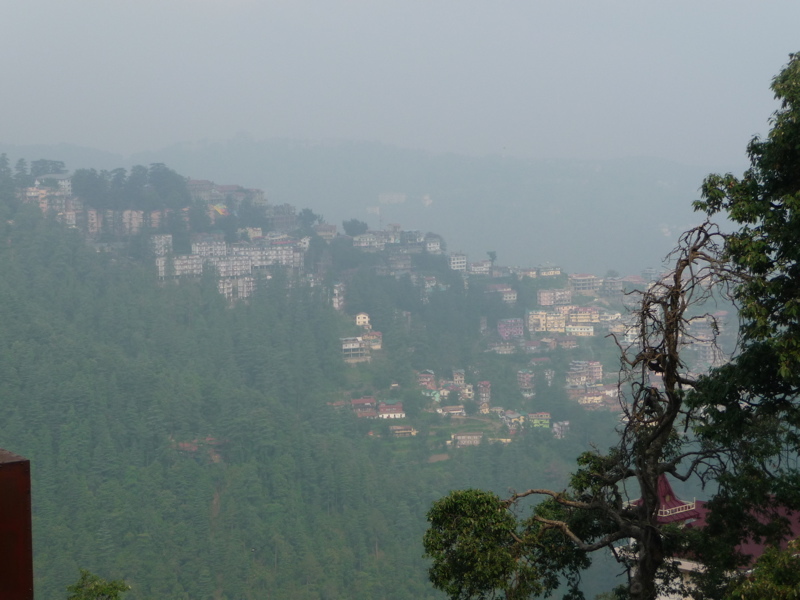 Here in Simla, the cool mountain escape from the vast plains so India, I am aware that this is a place of privilege, largely visited by the wealthy middle class. Beggars and gross poverty are much less visible here, unless you go down the many small alleys. He had such beautiful eyes and made a great job of my filthy shoes, even gluing bits of the sole that were loose. I had my first experience of having my shoes cleaned, a few days ago after several long walks in rain and mud. Here was another example of generosity, appreciation and sharing of goodwill. The young man doing me the honour spoke good English, learned on the street, and told me proudly how he had never gone to school but was a very good shoe doctor. He was a delight! 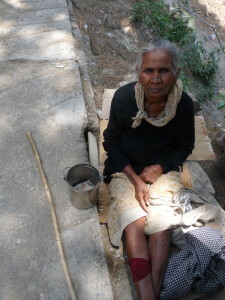 And several of the regular people asking for alms in McCloud Ganj were also inspiring – with their shining eyes (my two favourite old women) and warm thanks as they cradled my hands and face. What teachers to remind me of my enormous good fortune! Such warm thanks she would always give me! The common attitude towards photographing each other is also marked by generosity and inclusiveness. Certainly, the most common photo shoot is of the loved one or family group but, if anyone sees you pointing your camera in their direction, they quickly pose for you and we all exchange greetings. Frequently, we are asked to be photographed with their friend or loved one and then, again, friendly greetings and thanks are exchanged. So much warmth and friendliness! Photographs were taken all round, even by a man standing nearby! All this contemplation of the gratitude inspired by my senses, reminds me of the much greater gratitude for this precious human rebirth. I feel around me the multitude of teachers – speaking simultaneously in many tongues and one tongue – who have guided me, and continue to guide me through this precious life and their support is of inconceivable value. Thank you! Thank you, I say to them. Just one small example of my dharma teachers’ help comes to mind as I notice my increased trust and consequent reduced fear as I am driven on these narrow, winding roads, hugging the cliffs, with numerous blind corners that bus or taxi driver persistently overtake on, with horns blaring! I am amazed but not frightened! I put this relatively new ability to trust down to a combination of moment-to-moment mindfulness, ever-deepening awareness of impermanence and the consequent inevitability of unknowing what the next moment may bring. So there is no point in dwelling on possible outcomes and much more satisfying to enjoy the discovery of finding oneself still alive! Letting go of each moment and just being present seems to make one so much more appreciative of what is there. Mindfulness personified in deity form! I feel my experience of confronting fear when riding a motorbike also has helped me let go of attempts to control the future and just relax. 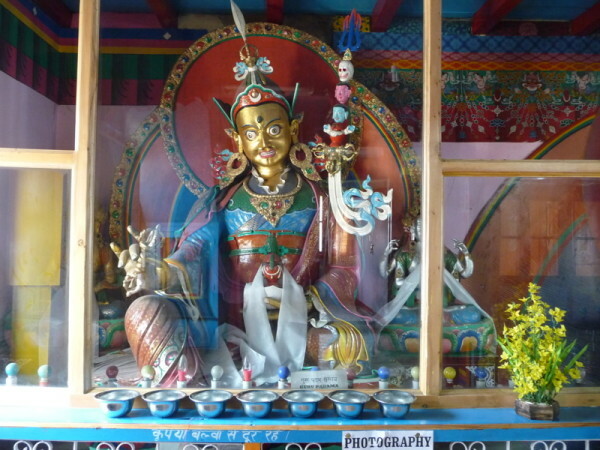 Finding my way through that learning time of stress and fear was also much helped by dharma exploration and teaching. So, so much to be grateful for and so much more that has not come to mind as I write this morning. My heart is singing and it is reaching out to all of you with love and appreciation of our various expressions of life. My turn to discover parts of your journey… I am looking forward to read more once I’ll get my computer back.